On tablets and desktops, text reflows to fit your screen comfortably: vertical or horizontal, and a wide range of window sizes. You can customize the font size to your preference and needs. The navigation menu retracts, so more of your screen real estate is devoted to reading space (which is what you are really there for). Improved mobile device toolbar scrolls with the page, sticking at the top. 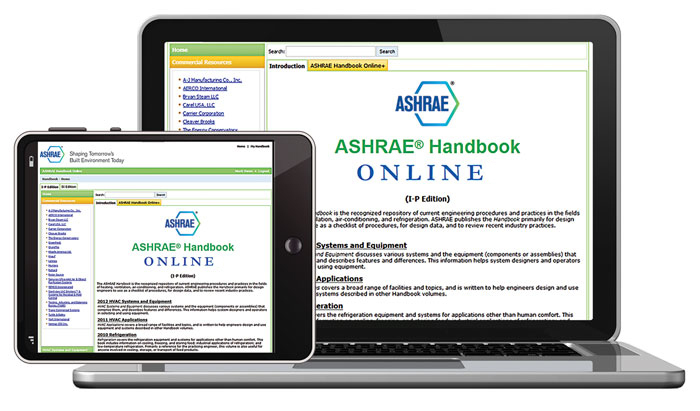 With these improvements, ASHRAE Handbook Online makes it easier than ever for you to search across all volumes, print, ask questions about technical content, access bonus features, and look up new terminology. Current subscribers can enjoy these features now. And eligible ASHRAE members can choose an ASHRAE Handbook Online subscription as one of their free member benefits when they renew their membership. Log in or subscribe now to check out these new responsive features. Immediate access as soon as you subscribe online - no waiting. All four volumes of the ASHRAE Handbook (I-P and SI editions). That's over 3,600 pages of expert-reviewed content in each set of units for use worldwide. Access anywhere you have an Internet connection - in your office - at home - on the job site. No need to carry books or CDs. Just log in wherever you are. Powerful, flexible search. Easy, effective, and fast. Updated content between print revisions. If an ASHRAE Technical Committee provides an update between print editions, you'll get it right away. Copy and print functions for your project records. ASHRAE Handbook Online provides convenient, web-based access to all four volumes of the ASHRAE Handbook anytime for your individual use. Corporate and multiuser access to the ASHRAE Handbook is available through ASHRAE Digital Collections. To learn more about how you can get access for your office, please visit ashrae.org/digitalcollections.